The term "player" or "user" includes any person or entity using the service, as well as any person or entity acting on behalf of such person or entity in relation to using the service. Any player, by using our service agrees to be bound by the terms and conditions of this agreement. These Terms of Service are in force whenever you are using Magicduel. You must be 13 years or older to create and/or use a MagicDuel game account. If you are under 18, you must have permission from your legal guardian or parents to create an account and play MagicDuel. If we feel this approval has not been given, we reserve the right to terminate the account without notice. Registration and access to Magicduel is completely free. You are obligated to fill in the registration form truthfully. You are not allowed to make accounts that are created merely for the benefit of one or more other account(s). When you agree to these Terms and Conditions you also accept the rules that must be adhered to on Magicduel. In violations Magicduel has the right to delete profiles, texts, or images. In extreme cases you will be permanently banned from Magicduel. Although Magicduel is monitored in the observance of the rules, violations of these rules may not always be addressed directly by us. Rules may change without prior notice. Not beeing up to date with latest rules does not consitute an excuse. You are responsible for your own account, for your pictures, ingame chat and profile. Magicduel is not obliged to give (virtual) stuff back. This is your own responsibility, whatever the cause may be. It is forbidden to use copyright protected texts or images on Magicduel, where found, these will be removed without notice. It is your own responsibility for the possible consequences. Magicduel is not responsible for text, images, or content of such third parties. The way you use your account and available resources, including purchased credits, its your responsability. You will not be given back credits that you missuse. Magicduel is always doing its best to offer a good service and have maximum uptime. However, we do not guarantee that our services are always available. At any time and without notice MagicDuel might stop its services. We have a "no reset" policy, trying to keep accounts on and not reset them even if they get terrible unballanced, but we might be forced to do such resets from time to time when major tehnical changes require it. Under no circumstances shall Magicduel be liable for any damages other than those caused in a grossly negligent or intentional way. Magicduel shall endeavor to assure a continuous accessibility of the server, however, does not assume any warranty in this respect. Magicduel is a gratuitous game without the optional functions. Therefore, Magicduel shall not assume any liability for the failure of server, for programming errors and damage caused in any other way. Magicduel employees, workers, staff members, representatives and vicarious agents, in particular in favour of the shareholders, employees, and representatives will not be liable for damages of any kind, including, without limitation; compensatory, consequential, incidental, indirect, special or similar damages, that may result from the use of, or the inability to use, the materials contained on Magicduel, whether the material is provided, or otherwise supplied by Magicduel or any third party. The player agrees to indemnify MagicDuel owner and coworking team against liability for any use of his account. The player agrees that no information obtained from MagicDuel owner and/or MagicDuel team, whether it is oral or written, will create any warranty. Some links on Magicduel lead to sources on servers hosted by independent third parties, over which Magicduel has no authority or control. Therefore, Magicduel takes no responsibility or liability for the material on those servers. Magicduel is not responsible for the availability of the data on those servers. Magicduel uses so-called credits. For a few additional options in the game you need to have credits. Magicduel credits are not free. Credits can be purchased with various payment methods. If you are underage you first need to gain permission from your parents and/or legal representative before purchasing credits. You always need permission from the payer of the bill before you purchase credits by telephone. Abuse of our payment system is never passed unnoticed. If you get caught abusing our payment system then you will be permanently banned from Magicduel, and we will take further steps against you. 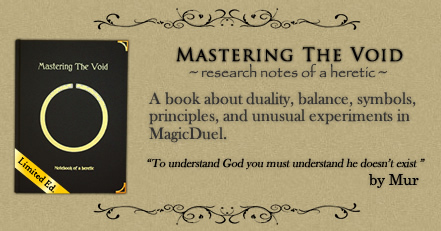 Magicduel is not liable for any errors or abuse by third parties, the person themself, or by faults or errors on Magicduel. Complains about fraudulous payments that lead to canceling such a payment will also lead to the permanent ban of that account from MagicDuel. Repeated subscription and canceling of subscription will lead to a restriction to use the subscription payment method. The player agrees that he is not eligible for refunds under any circumstances. Abuse of Magicduel is strictly prohibited, it means that no advertisement should be made for commercial purposes. It is also forbidden to use logos/images/texts and other parts of the site for purposes other than Magicduel. The abuse of exploits/bugs/hacks and other ways of cheating are also not allowed. When this is not reported and we catch you, you will be punished accordingly, which can even range to a permanent ban from Magicduel. Player names that cause confusion or are reserved for game characters or by team members will be deleted or changed with or without warning depending on their number of active days. MagicDuel team may, at their disgression, terminate any game account with our without notice, without disclosing a reason for doing so. Under these circumstances any remaining time or services paid for will become null and void and any items on the character will be deleted. We are very openminded about roles, discovering a bug or a possible exploit might lead to creative usage, in such cases your punishment might also be done in a very creative way. There are no fixed rules about what gets punished and what not but each decision is taken after careful analysis of the situation. Magicduel tries to update/modify and/or supplement its content frequently. Despite the care and attention, it is possible that the content is incomplete and/or inaccurate. Changes can take place at any time without prior notice. Magicduel is not liable for the consequences of the changes. MagicDuel is a constant changing evironement, when registering a player account you agree that future changes might affect your account in ways you were not warned. In case the main news system is down due to technical issues, the MagicDuel forum will be the next official place to announce what is going on. All code, design, artworks and content on Magicduel, with the exception of links, images, texts hosted on third parties, are fully owned by Magicduel Adventure LLC and/or individualy by its shareholders. All the accounts created are the property of MagicDuel. Magicduel Adventure is a registered mark, nothing on Magicduel may be used without written permission. Magicduel will never abuse your information that you put on the website. On the registration form we only ask for the information that we need to identify you as a user. Magicduel will at all times honor the privacy of its users. E-mail addresses will only be used for Magicduel. These will be carefully preserved and not be provided to third parties with the exception of a sale or transfer of Magicduel or when we get a judicial order against a perticular account. We register all IP addresses of all our users. Psihological profile information is stored for internal use and statistical purposes. You are not obligated in any way to provide accurate response to profiling questions you may encounter during your play, but doing so will help us improve MagicDuel. All available resources can be used to track abuses. Alternate accounts of a single person are kept private unless there is an abuse. We reserve the right to list the playernames of all the accounts owned by a single person when such an abuse happens. To report game issues or bugs please use the forum. If you do not agree to our Terms of Service you may not participate on Magicduel. Magicduel reserves the right to adjust these Terms of Service at any time with or without prior notice. Check the Terms of Service regularly.